Christian Holder is best known as being one of the iconic dancers of the distinguished and ground-breaking Joffrey Ballet Company. Knowing of his dance background and little else I had no idea what to expect of cabaret featuring the man himself. 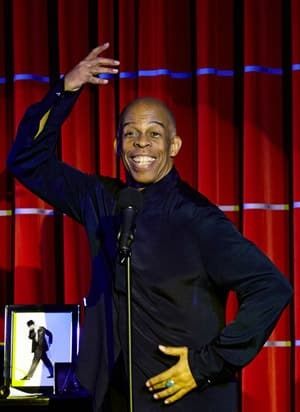 Currently performing for three nights at Crazy Coqs at the behest of its artistic director Ruth Leon, Holder has put together an evening he calls SUITE 60, and what an evening it is. Holder draws inspiration from the period, and his set list draws not only from Broadway in the 60’s, but from sources as varied as Motown, The Righteous Brothers and The Beatles. Nothing about an evening of Christian Holder in cabaret is what you expect it might be. If you are expecting an evening of songs, rolled out one after another, you’ll be disappointed. This is far more than that. Living in New York at a time when an enormous cultural explosion was in full force, you get the feeling that Holder soaked up a plethora of influences like a sponge. Every nuance of Holder’s performance is influenced by those life experiences. As someone whose life was so heavily influenced by the dance, it pervades every inch of his being, and can be mesmerising to watch. Holder tends to spend a bit more time than most providing background to the material he is presenting, slowly building an atmospheric canvas layer by layer as the evening goes on. I found that by the end I wanted to sequester him away and talk for hours about his experiences. I found his tales addictive. Incorporating sound recordings from the period, Holder succeeds in weaving a spell over his audience. It’s a blend of live performance and multi-media, that is perfectly placed in the intimacy of a venue like Crazy Coqs. Holder doesn’t have the greatest voice in the world, but his ability to deliver truth and drama through song enables him to captivate an audience for nearly two hours and leave them wanting more. Joined on stage by his musical director / accompanist Phillip Foster, the two have a synchronicity which is sorely lacking in some cabaret today. Foster provides a rich accompaniment, full of light and shade, but elegant in it’s subtlety. Superb! Holder was joined for a final number by Michelle La Fortune, Jill Rensing and Vanessa Kosejkova, three soulful vocalists that rounded out the evening nicely. Holder and Foster really are a joy to watch and it’s an evening of cabaret I’d certainly recommend. PS. I heard through the grapevine last night that Crazy Coqs will be transforming to a live comedy venue in the very near future – are they insane?